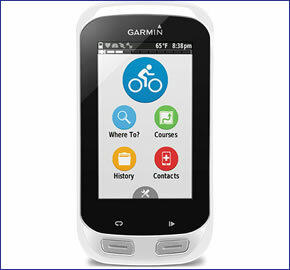 Garmin Edge Explore 1000 is a cycling GPS with a 3-inch touchscreen. European mapping is provided and the maps include cycle paths, elevation data, points of interest and address search. Smart notifications for receiving calls and texts are available when using a compatible smartphone connection. The Garmin Edge Explore 1000 allows wireless transfer between other Garmin devices to share routes. The battery life is 15 hours (GPS training mode) or 24 hours (UltraTrac mode). 15 hours, it is waterproof to IPX7 standards and it is also shock resistant making it ideal for use on rough terrain when cycling offroad. Accessories, spares and parts are still available for your Edge Explore 1000. The Garmin Edge Explore 1000 is cycling satnav with both on-road and off-road navigation capabilities with a 3-inch touchscreen. This cycling GPS system is preloaded with Garmin Cycle Map (European coverage). Wireless unit-to-unit transfer is also available for sharing routes and competing with friends and family. A barometric altimeter is available to tell you the height of land you are cycling on. Enter your own route or input the distance, starting direction and other parameters and the Garmin Edge Explore 1000 will calculate three round-trip options for you to choose from. You can plan new routes on the GPS device or on an app before you start cycling. You can save 200 waypoints and 100 routes to the Garmin Edge Explore 1000. Smart notifications such as incoming calls and text alerts are available directly on the Cycling GPS system with Smartphone connectivity. Instant uploads and weather are also a feature of the Edge Explore 1000. Live tracking is also available for friends and family to follow you on their computer, table or smartphone. An SD Card Slot allows you to add additional mapping to the Garmin Edge Explore 1000. The Garmin Edge Explore 1000 is shock resistant and is IPX7 waterproof making it ideal for use on a bike. A built-in battery has a battery life of 15 hours (GPS training mode) or 24 hours (UltraTrac mode). Incident detection can automatically contact the emergency services telling them your GPS location in the event of an emergency. These alerts can be set to automatic or manual. Create routes on Edge Explore 1000 using preloaded map and points of interest. Plan and download routes using Garmin Connect (desktop or mobile) or third party apps. With the Garmin Edge Explore 1000 you will be routable along roads and paths. Elevation data, points of interest and address search are also available. When doing laps of a circuit Auto Lap Mode automatically starts a new lap when you complete a circuit. When cycling Auto Scroll Mode cycles through data pages whilst you are riding your bike. Heart rate calories computation is another feature of the Garmin Explore 1000. Temperature readouts are also available on screen whilst you are riding. A bike speed/cadence sensor and heart rate monitor is available with some models. Compatible with the Edge Remote accessory you can change the screen on the Gamrin Edge Explore 10000 while keeping both hands on your bikes handlebars. The Garmin Edge Explore 1000 is also compatible with the Varia rearview radar and bike lights - warns cyclists of traffic approaching from behind up to 140 metres (153 yards). Smart Bike Lights are also available which will adjust automatically to changing speed, changing light conditions (ambient light sensor) to help keep you safe on the road whilst cycling. The Garmin Edge Explore 1000 also features GPS and GLONASS satellites connection technology. Looking for accessories and spares for the Garmin Edge Explore 1000? All parts are genuine Garmin product and specifically designed for use with the Garmin cycle GPS 810 device. Discover the optional range of maps that you can add to the Garmin Edge Explore 1000 here. Maps available include GB Discoverer Ordnance Survey (OS) mapping, Cycle Map Europe and TOPO topographical mapping. Do you have a question about the Garmin Edge Explore 820? Submit your question via our contact page.